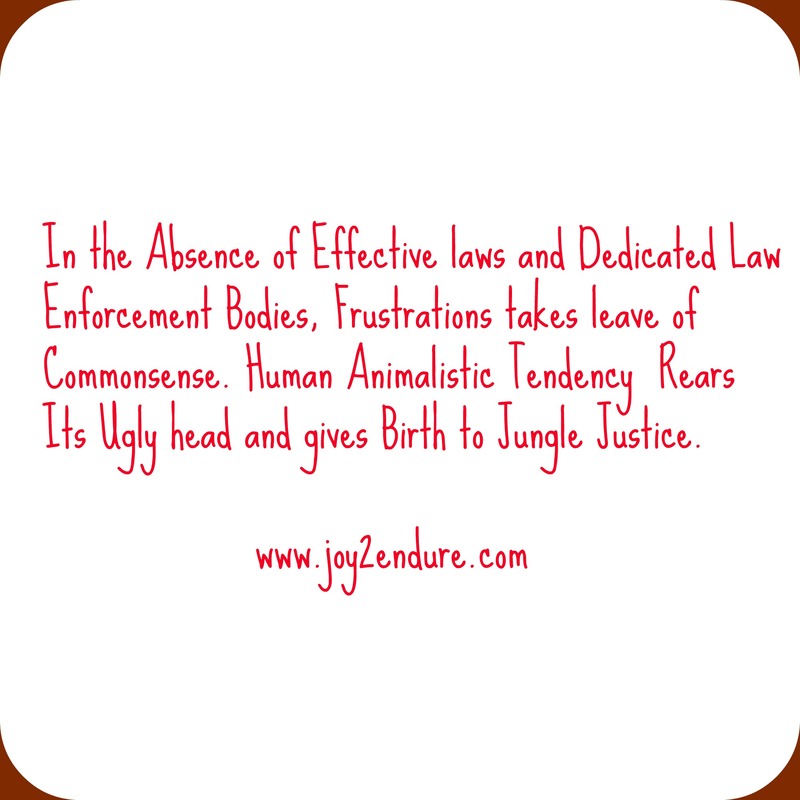 JUNGLE (MOB) JUSTICE : The Solution to Increased Crime in A Failed System? On November, 16th 2016, Social Media was flooded with the image of a supposed 7 years old; who was allegedly burnt to death in Nigeria. Many onlookers apparently stood by doing nothing while busily taking pictures of the incident. What was his crime? He stole garri (tapioca); a cassava staple common in Nigeria, Cameroon, and many African countries. Though there are several versions of this story with some saying the victim was a confirmed thief, operating with a gang notorious for killing women and robbing them who ran out of luck that day; incidents like these have become very common in Africa especially in Nigeria and Cameroon. Many attribute it to the failure of the system’s arm of the law to enforce strong laws which brings justice to victims of committed crimes while punishing culprits. As I read different versions of this unfortunate incident, I was transported back in time to a mob justice I could have witnessed which was thwarted by the timely intervention of the police, thus preventing a man from being lynched by an angry mob. One thing kept playing in my head. How did we reach this stage to the extent that, we turn a blind eye to the plight of a presumed hungry child and instead watch him roast to death? When did we take leave of our collective consciences? What is jungle or mob justice? Simply put, it is a justice system where innocent until proven guilty doesn’t exist. A system where the cry of ‘thief’ heralds the punishment because the victim has already been judged without trial and found guilty, liable to death by stoning or whatever punishment method the crowd deems appropriate; most of the time, victims are roasted alive. Mob justice is a symbol of a dysfunctional society where the state has lost control of its populace and the instruments of law and order are ineffectual; making individuals take the laws into their hands. In recent years especially in most parts of Africa and Cameroon at large, the fastest way to administer justice was to create a militia group made of up vigilant young men charged with providing law and order, protecting their communities against crime where the forces of law and order failed or remained indifferent. These militia groups are swift in administering justice... most often people caught are beaten within an inch of their lives and left for death or beaten to death. Just a few years ago, there was a global outcry and condemnation of mob lynching of four students in Nigeria, who were later found to be innocent. These incidents are not limited to Nigeria as the practice is very much alive in Cameroon especially in some of our big towns like Douala, Yaounde, and Bamenda. There is usually euphoria in the air when a thief is caught. It is like people wait in expectation for that cry to unleash their anger and frustrations on the unsuspecting victim which has unfortunately resulted in one too many an untimely death of an innocent bystander caught in the confusion of an angry mob who have lost all sense of reason as their singular intent at that moment is to split blood. They come charging and raging like mad bulls lured by the smell of blood to create havoc to any who dared be on their path. Which begs the question is jungle or mop justice the solution to crime control in a failed system? Some while not directly applauding this form of justice indirectly look for ways to justify it. For example, the mop justice I nearly witnessed happened in front of a colleague and I. Upon asking why the angry people couldn’t wait for the police and the possibility of beating an innocent person to death as is often the case, my colleague came with this rejoinder; ‘What could the police do? They would take the thief away and one or two things would happen the person would be free to go; back in the streets tormenting and terrorizing people.’ When I responded that still doesn’t give people the license to burn anyone alive, my colleague said and I quote; ‘ If tif man nova press you, you no go understand’. Loosely translated as if you have never been a victim of thieves, you can never understand. This is the sentiment shared by many people. They are against jungle justice but weary of the prevalence of crime, killings and the noticeable indifference of the powers that be to do anything which has prompted the common man to take matters into their hands resulting in incidents like what we have been seeing recently circulating Social Media. There is a need to do something and fast too if we do not want to see more alleged garri stealers die or many innocent people dying because they found themselves at the wrong place and wrong time. Prev Debunking Myths 4: Ten Misconceptions about Sickle Cell Everyone Should Know. Next A WARRIOR’S MUSINGS: Six Essential Things You Can Find In a Lady Warrior’s Bag. Thank you very much sis. it is truly always heartwarming to come home so to speak and feel your presence. Yes, the forces of law and order have failed people again and again. But truly, our humanity get’s questioned when innocent people are killed thisway and young kids are burned alive instead of being corrected. We need to raise awareness on a lot of prevailing social issues. Hello Delilah, thank you for coming by and for taking the time to comment. Sorry about that don’t be discouraged please. Do come again and keep commenting, thank you. Thank you so much, Armando I am glad you find this useful, please do come again. Thank you kindly hope she finds it useful. Thanks for publishing this awesome article.I really liked your article and will definitely share this on my Twitter.Thank you for a great post. Thank you for stopping by. I am glad you liked the post. Please do come again. Thank you for stopping by too and for the kind words. Please do come again.